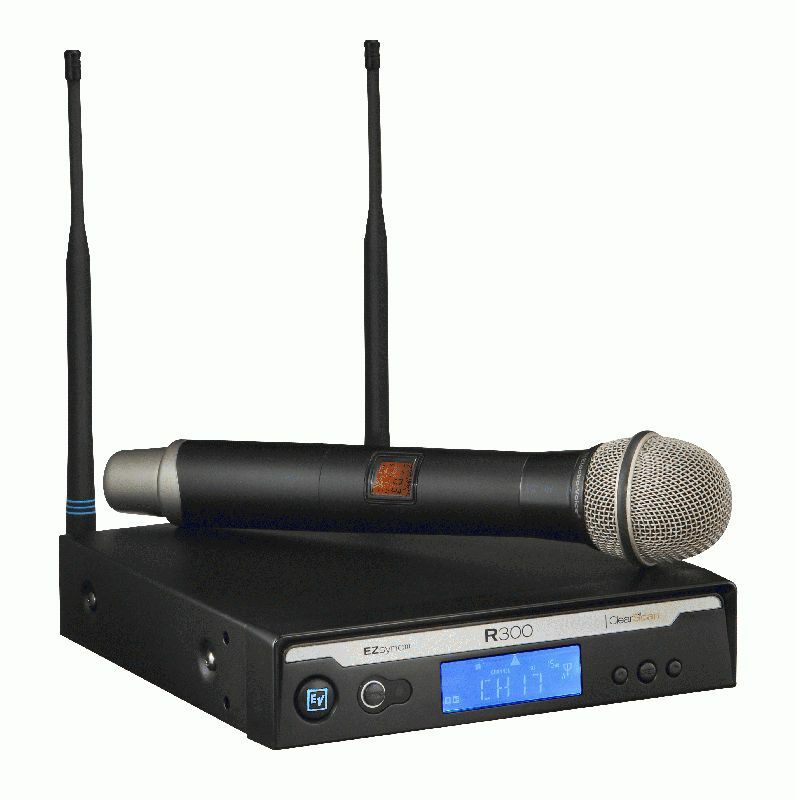 Electro-Voice is pleased to introduce the R300, a breakthrough wireless microphone system that opens up a brand new category in today’s wireless marketplace – Entry-Level Professional – and brings world-tour-proven Electro-Voice wireless technology to a new, more accessible price point. Unique features like One-Touch ClearScan and EZsync make the R300 quicker and easier to set up and use than any other similarly priced wireless system, while its rack-mountable metal receiver, sturdy metal bodypack and handheld transmitters, and remote-mountable antennas are of a build and performance quality usually reserved for higher-priced professional products. This unprecedented combination of value, professional features, and road-ready ruggedness make the R300 a perfect choice for a wide range of wireless applications, from live vocals and instruments to professional presentations. Three different microphone configuration packages are available: handheld, headworn, or lapel. With a sleek, low-profile design and durable construction, the R300 receiver system is equally at home on a table top or in a 19-inch equipment rack. Its simple controls and easy-to-read display are designed to provide the ultimate in user-friendly operation. Rack-mount kits and front-mount antenna cables are available for professional installation. For applications with up to four receivers in one rack, the APD4+ antenna splitter can provide antenna and power feeds. The all-new metal BP-300 metal bodypack transmitter that is rugged, compact, and easy to use. Using two AA batteries for 14 hours of use, the BP-300 is one of the most economical transmitters available for day-to-day operation. The unit’s mute function keeps the RF signal live while muting the audio, protecting your channel and preventing noise in the audio system. Two preconfigured bodypack systems are available, with either a lapel or a headworn microphone. The bodypack’s TA4 connector allows the unit to be used with other Electro-Voice lapel or headworn microphones. The HT-300 metal handheld transmitter is made to withstand the rigors of daily use while being comfortable in the hand. The unit’s PL22 dynamic microphone capsule offers the perfect all-around solution for speaking, singing, and emcees. The PL22’s cardioid pickup pattern rejects surrounding noise, helping to control feedback while still allowing an experienced vocalist to “work” the microphone. Proven at the highest level of touring and trusted in thousands of installations around the world, Electro-Voice’s industry-leading ClearScan system scans through the R300’s 32 preset channels and selects the clearest channel – all with the touch of a single button. In an increasingly challenging RF world, ClearScan gives you the confidence to go wireless without worry, ensuring noise-free operation and the longest operating range. Matching the R300’s transmitter and receiver frequencies is also as simple as the touch of a button. EZsync uses infrared technology to set the transmitter to the correct frequency, confirming operation in one automatic step. Error-free wireless setup has never been easier.